My Baking Blog: Happy 冬至 and Merry Christmas! I have been really behind in my blogging! I had bought 2 new recipe books at a book sale, but had not had the time try any new recipes since I have been spending more time on some paid orders for the past 2 months. Having worked really hard the past week, today, being Christmas day, is a day to relax and enjoy! I did not even have time to make log cakes this year. A few days back, we celebrated Dongzhi festival. According to wikipedia, Dōngzhì Festival or Winter Solstice Festival (冬至; literally "the Arrival of Winter") is one of the most important festivals celebrated by the Chinese and other East Asians on or around December 22 when sunshine is weakest and daylight shortest. According to wisegeek.com, it is also a time to celebrate the end of the harvest, and also to honor ancestors and champion family togetherness. Traditionally, it was a time for the family to get together (after being away for many months), and the whole family makes the glutinous rice balls together. Today, it is not that significant anymore since our families get together physically or virtually (thanks to communication technologies!). In Singapore, especially when we get almost the same amount of daylight whole year round and we don't harvest crops (except perhaps in Farmville :P), so the real significance of Dongzhi festival doesn't apply to us I guess. 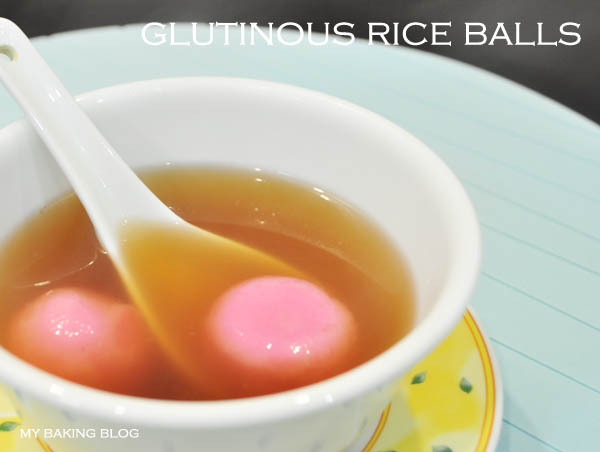 Still, we follow the tradition of eating glutinous rice balls. Well, it's food! These are balls made of glutinous rice flour. I don't make my own. In fact I prefer the store bought ones which are available all year round and are more chewy. I especially like it when the filling will ooze out the moment you sink your teeth in it. I always eat it in 3 steps: bite a small bit off, watch the filling ooze out and when I'm done with smiling foolishly at the filling, gobble up the rest of the ball. There are 3 flavours, namely black sesame, red bean and peanut. Black sesame is fragrant, but I don't like that after eating them, some sesame will be stuck in my teeth and gives them a black border each and make them look real funny. I don't loathe red bean but my favourite is peanut flavour, although I'm not sure why the brand I buy only makes the peanut ones in pink....which is quite my most dreaded colour. Cooking the balls is a breeze. Take them out of the freezer, no need to defrost (yes! ), throw them into a pot of boiling water. Add some sugar (I prefer brown) to the water for some flavour. Wait for a few minutes, when they float, they are ready! All these in just 10 minutes. There is a packet of grated peanut that accompanies the pack. Usually I do not use it and throw it away. This year, I rolled one of my balls in the grated peanut and it becomes a double-dose-peanut mochi ball! Pretty nice! Hmm....just thinking about that oozing peanut filling has got me wanting for more again. Perhaps I shall go buy a pack again. Oh yes, if you prefer, you can put the cooked glutinous rice balls into a bowl of warm soy bean milk. Just as nice!